All orders over $100.00 shipped for free: Any order that you place with us with a value over $100.00 is shipped for free anywhere in New Zealand. Tanji's Art Supplies has become recognised as one of New Zealands leading suppliers of professionally made artists surfaces and components for making and stretching art canvases. Whether you are looking for hand crafted cradled panels or stretched canvases of the highest quality, Masterart artists surfaces specialise in producing what you need in a durable art surface. We produce all of our stretcher bars and art panels in our factory located in rural Tauranga and ship all over the world including the Pacific Islands, Australia and the UK. Our ability to produce our own stretcher bars in aluminium and kiln dried pine mean that we can make almost any custom sized canvas that an artist desires and ship them anywhere in New Zealand. Because we are a specialist producer of art surfaces, we also produce custom stretcher frames for picture framing houses as well as digital printing companies and will often stretch finished paintings or large format print images. Masterart proudly produces some of the larger canvases made in New Zealand. 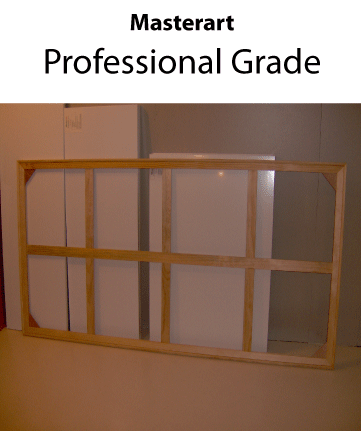 We have had years of experience building the best artists grade canvases in New Zealand. a consideable amount of time has gone into research, testing of materials, applying different methods of assembly and stretching of canvases, which means that the canvas that you buy from Tanji's Art Supplies will endure well in to the future. Masterart Heavy Duty interlocking stretcher bars are made from 32 mm deep, kiln dried radiata pine. Produced on our own factory in Tauranga, we can produce almost any length stretcher bar and bracing combination required and ship it within just a few working days. Masterart Produces stretcher bars for some of New Zealands more successful and recognised artists who prefer to stretch their own canvases. Easy to assemble, each stretcher frame is fully custom made in our workshop to check quality and straightness before being collapsed, shrink wrapped and shipped to our customer. Because every artist is different, Masterart produces a wide range of canvas types. However, durability and stability are built in to every artist surface supplied. Masterart Stretcher bars come in three designs: Exhibition, Professional and super heavy duty - Dura-Stretch aluminium stretcher bars. 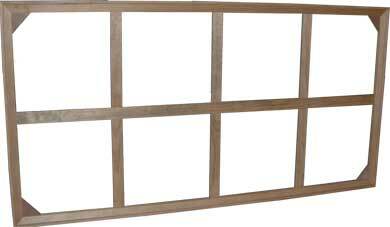 Our timber Stretcher bar moldings are locally produced from renewable resources. Even our Dura-Stretch stretcher bars are made from 80% recycled aluminium and are re-recylable. All of our timber stretcher bar molding is milled to close tolerances 0.2 mm and is then hand selected to optimise the straightest materials. Masterart Stretcher bar designs feature a rounded leading edge with a high canvas clearance that lifts the painting surface up and away from the underlying structure. This prevents ghost imaging from occurring and allows for air to flow freely behind the canvas enhancing the life of the artwork. Braces are an essential component of ensuring the integrity of larger canvases. Where necessary, cross braces are incorporated to minimise bowing and scolloping of the stretcher bars. Masterart is one of New Zealand's leading producer of very large artists stretched canvases. As a dedicated manufaturer of artists surfaces, we produce all of our own canvas supports in-house which means that we can customise our products to suit the requirements of our artist clients. In New Zealand, the fine arts industry is quite unique to most of the rest of the world. New Zealand artist tend to want to spend their time painting or 'doing what they do best' which means that artist prefer to buy their surfaces ready to use without the time consuming requirement of having to assemble, stretch, size and prime their surfaces. Masterart Ltd has developed to become an expert producer of high quality artists surfaces, supplying to many of the leading artists in New Zealand, Australia and the Pacific Islands. There is something special about really big artworks. 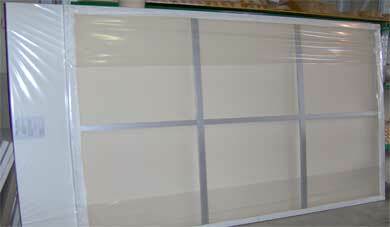 While Masterart does produce stretched canvases up to 4800 mm long, most large format canvases are not that big. However, serious consideration needs to go in to the construction of large canvases as the stresses and strains of constantly adjusting tension needs to be accomodated. 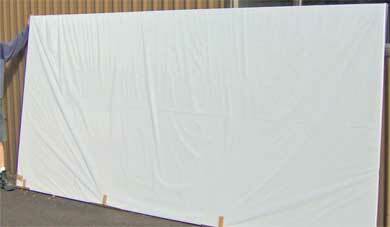 The textiles utilised to produce Large format canvases need to be sufficiently strong to support the paint film. Masterart Utilises its own unique pre-primed canvases to produce large format stretched canvases that are designed to enable a degree of expansion and contraction. Timber has been the material most commonly utilised to manufacture canvas supports. It is readily available and relatively cheap. However wood tends to have inherant properties that can cause issues such as twisting and bowing as a result of temperature or humidity fluctuations even quite some years after installation. Masterart DURA-STRETCH aluminium stretcher bars are a uniquely designed canvas support made specifically to over come many of the issues that are related to timber stretcher bars. Because Masterart DURA-STRETCH stretcher bars are so much stronger and stiffer than traditional wooden frames, they are more suited to large format canvases. 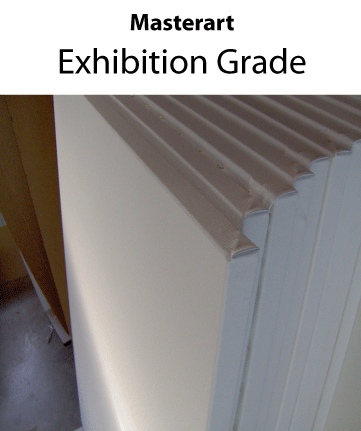 However, many New Zealand artists now utilise DURA-STRETCH canvases exclusively as they are ideal for shipping overseas without concerns for biosecurity issues and are suitable for environments that have high humidity or subject to large temperature and humidity fluctuations which can cause deformation and deterioration of the canvas.